Rocky Point vacation homes tend to be bright and colorful, with amazing views of the sea - or they can be like this one and actually sit on the beach! Step off your patio and the beach starts there - walk a few yards and your toes are touching the water’s edge - can it get much better than this? Well, as a matter of fact it can and it does when you’re staying in this cozy beachside 2 bedroom, 2 bathroom cottage! Mint green stucco walls with dancing kokopelli figures and skittish geckos line the outside walls of the cottage, hinting at an interior that is both whimsical and fun. Shall we step inside and discover for ourselves? Turquoise walls, mimicking the color of the seas, give you the feeling of living in a life-sized aquarium when you first open the door to this fairy tale beach cottage. Under the sea artwork and giant fish figurines attached to the walls of the living room intensify that feeling, and the sandy beach framed by the clear blue waters of the sea that are visible through the oversized sliders will soon have you wondering if you have grown gills! Open the patio doors and smell the briny scent of the ocean as you feel the salty air kiss the skin of your cheeks. The couch in this living room opens into a queen sized bed; this may be your happy spot, but keep looking, there’s more to see. The fully equipped kitchen with its sherbet color cabinets and colorful Mexican tiles are sure to bring a smile to your face while preparing breakfasts that can be eaten at the generous sized breakfast bar, or more formal dinners served at the dining room set nestled cozily in front of sliding glass doors that lead out to a charming open air courtyard containing a charcoal barbecue grill perfect for grilling the fresh fish you catch each day. Both bathrooms are alive in color with the Mexican tile trend continuing into each room; coral cabinets in one bath serve as a happy reminder that you aren’t in Ohio anymore! The bedrooms are airy and bright, both with plush queen beds and colorful coverlets - only happy dreams are allowed here! The décor of this entire cottage is of traditional Mexican style: brightly painted clay suns, colorful fish and geckos, and strings of plaster chili peppers painted a happy red adorn the walls of every room; it’s difficult not to be happy when staying in one of the most cheerful Rocky Point rental homes, don’t you think? 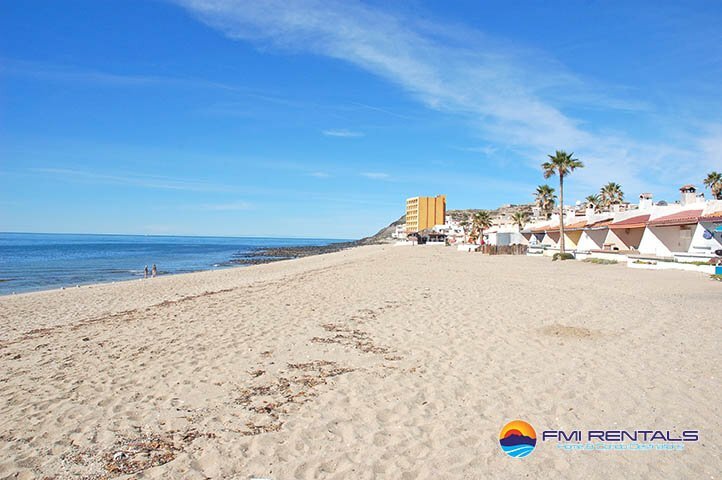 Should you manage to drag yourself away from one of the best vacation homes Rocky Point has to offer, you will find you are within walking distance to several amazing restaurants, as well as clubs that are hopping till the wee hours of the morning. If you have driven to Rocky Point, your car will be safe and secure in the spacious single car garage until the sad day of your departure from this south of the border paradise.